A slow growing, suckering small shrub. This cultivar has silvery-blue foliage. 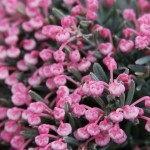 The small, early spring, urn shaped flowers are clear pink. Requires a cool, peaty or sandy soil with constant moisture. 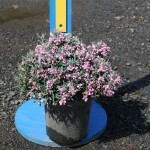 It can be used as a slowly spreading groundcover, for a mass planting, or a rock garden.